We took at a look at this important chart and decided to make a few changes – removing some older models, such as the Ibanez Paul Stanley Signature PS120SP, and inserting some newer guitars, including the awesome Charvel Pro-Mod DK24. We also added the cool Ibanez S Series Iron Label SIX6FDFM and the versatile Lee Malia Signature Les Paul from Epiphone. If you can afford to spend around a thousand bucks on a guitar, you’d better prepare to become the envy of your pals, as your generous budget allows you to choose from a staggering level of quality. A New Era For The Electric Guitar! You’re Not A Beginner… Are You? Whether you have your eye on a genuine American Strat, a one-of-a-kind body design, or the signature axe from your favorite shredder, that $1000 pretty much guarantees you’ll find a guitar you love, and one that will last a lifetime. Naturally there are a few duds out there, but providing you are clever you’ll be able to find something that rivals even those guitars sold in the $2000 range. In the chart below we have highlighted some of the guitars that offer the best value for money in this price range. A special Stratocaster at an excellent price. An authentic Fender Tele – a steal at the price. Focused tone and insane playability from this Mark Holcomb signature. A shredder’s new best friend. Schecter add a true metal masterpiece to the collection. A versatile artisan Les Paul with Gibson USA pickups. An excellent all-round rocker from ESP. A slender metal beauty from Ibanez. The essence of Eddie Van Halen in a single Strat. This faithful Thunderbird replica brings 1963 back to life! While others try to replicate its looks and sound, there’s nothing quite like holding a real Fender Stratocaster. Squier and Made in Mexico Strats are both fine guitars in their own price ranges, but a real American Strat – which consistently features in our definitive electric guitar charts – for under a grand is a purchase you’d never regret. With a solid alder body and classic contoured shape, this Strat features a very playable bolt-on maple neck with 22 jumbo frets. The sleek looks are matched entirely by its versatile sound. The three Texas Special single-coil pickups offer a plethora of tones for clean or distorted playing, making it perfect for country to rock, and anything in-between. This masterpiece (reviewed in full here) is well worth the price tag. If you’ve ever dreamed of owning a real American Telecaster, then that dream could be coming true – especially as its under $1000! This hugely versatile American Special Tele – reviewed in full here – has an alder body, with a lovely modern C-shaped maple neck, and maple fretboard with 22 jumbo frets making this a pleasure to play. 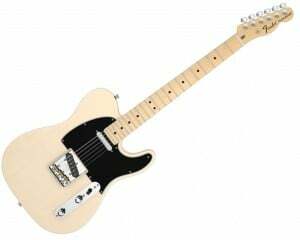 This Tele features two Texas Special single-coil pickups; well balanced with grit and warmth at the bridge, and full meaty tones at the neck. Coupled with a traditional 3-saddle vintage-style bridge and solid tone controls, this will appeal to any guitarist looking for that classic Tele style, sound and versatility. PRS have a talent for collaborating with artists to create epic signature models – Carlos Santana, Mark Tremonti, Chris Robertson, and now Periphery guitarist Mark Holcomb with the MHHB2 SE. Featuring a familiar SE body made of solid mahogany with a beautiful quilted maple veneer top, the fit and finish of this model feels very high-end, even though it’s a Korean-made guitar. The 24-fret maple neck is a highlight – satin-finished, wide and thin, and hugely playable. Another highlight? The awesome electronics, which come in the form of Seymour Duncan Alpha (neck) and Omega (bridge) humbuckers, with simple controls and coil-splitting. These deliver a focused, modern tone with great output – perfect for so many heavy music styles. There’s more on the MHHB2 SE in the complete review. A new entry to this list is the Pro-Mod DK24 HSH 2PT CM from the rock-infused Californian brand Charvel. With two satin finishes to choose from, it looks the part and feels the part too with a super-slick caramelized maple neck. With hand-rolled fretboard and a compound radius, it’s good fun to play and fast, fast, fast! Its sound quality matches its speed, with three solid Seymour Duncan pickups (two humbuckers and a single-coil), including a well-balanced Full Shred SH-10B at the bridge. Appointments such as the Luminlay side dots and Gotoh Custom 510 floating tremolo bridge just add to the value. Check out the full review where you can read more on this awesome Pro-Mod DK24 HSH. Don’t be fooled by this guitar’s gorgeous looks – it’s a true metal monster. Shechter have a gift for making guitars that marry beauty and performance and this Hellraiser C-1 is proof. Available in four dark colours, there’s a double cutaway mahogany body with an arched top, giving way to a three-piece mahogany set neck with rosewood fretboard. With two active EMG pickups this guitar has a massive output with clarity, tone and aggression in equal measure. Coupled with the fact that you can turn these into bright single-coils at the push of a button, the versatility of this axe is plain to see. Grover tuners and a TonePros tune-o-matic style bridge ensure excellent tuning stability. Make sure to check out the full Shechter C1 review of this beauty. What happens when Epiphone and Bring Me the Horizon lead guitarist Lee Malia collaborate on an instrument? This gorgeous signature Les Paul is the result! Instead of being the all-out monster you may expect from a metalcore signature guitar, this Les Paul features a pair of Gibson USA-made pickups that offers excellent versatility for all styles – a P-94 single coil at the neck and an 84T-LM humbucker at the bridge. Ultimately you can pick up this axe, never shred once, and still find great value! It’s a good-looking, well-made axe too, with a stripped-down mahogany body and an understated woody walnut gloss, with striking all-gold hardware. We have more on the Lee Malia Signature Les Paul in the full review. While ESP may not share the iconic status that Gibson or Fender enjoy, their guitars can certainly hold their own when it comes to quality in a competitive market. And as we found out when reviewing the EC-1000 Deluxe it’s a beautiful high-end performer, and one that would appeal to any rock-inclined guitarist. Aside from the head-turning dark looks – thanks to its Les Paul-style mahogany body with flamed maple top – it sounds awesome. There are EMG 81 and EMG 60 active humbuckers at the bridge and neck respectively, giving big sound with lots of bite. It’s lovely to play, with a fast mahogany neck and 24 jumbo frets, along with great tuning stability thanks to locking tuners and TonePros locking tune-o-matic bridge. From Ibanez’s metal-focused Iron Label collection, the SIX6FDFM is a simple guitar in essence, but one that does the basics very well indeed! This includes offering a beautifully-slender S Series body, with a comfortable feel, a striking blue finish and a super-slim Nitro Wizard neck with bound ebony fretboard. Playing lead on this is an absolute joy – as we highlight in the full SIX6FDFM review. Electronics come in the shape of two powerful DiMarzio Fusion Edge ceramic humbuckers at the bridge and neck, offering a tight and punchy metal tone – it really cuts through a mix. Tuning stability is solid thanks to the Gibraltar II fixed bridge and locking machine heads. Well worth checking out. If you know anything about music, you’ll instantly know the artist behind this guitar! Eddie Van Halen’s stamp is all over this Striped Series Strat from EVH Guitars. With a choice of three iconic EVH colors, this model features a typical Strat body made from solid basswood. The neck is a beauty, made with quartersawn maple and featuring a compound radius, hand-rubbed finish and 22 jumbo frets for serious playability – as we highlight in the full review. Of course, there’s just one humbucker and a single volume control, but this simplicity is all you need to recreate some screaming EVH tones. Throw in a quality Floyd Rose Locking Tremolo bridge with the EVH D-Tuna device, and you have one awesome guitar for the price. On first glance this guitar may seem like the wildcard of this list, but when you realize the performance, playability and versatility of this T-Bird, you’ll understand why it’s included in this higher-end chart. 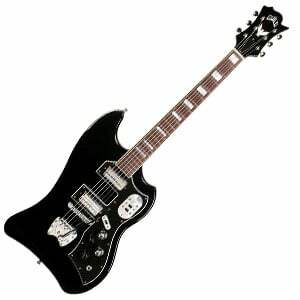 The S-200 is a faithful replica of the original Guild Thunderbird, first released in 1963. And there’s plenty of retro-inspired appointments, with LB-1 humbuckers, a fully-adjustable Hagstrom Vintage Tremar bridge, and the cool Guild headstock with open-geared tuners. Of course, Guild are very faithful to the one-of-a-kind asymmetrical body shape, made with solid mahogany, while the mahogany neck is very comfortable to play – as we highlight in the full review. Tonally there is so much scope with the S-200. A fun guitar that’s no novelty item. As we’ve seen, high-tech electronics and quality hardware are available to every guitar manufacturer these days, which allows them to pump their models full of premium components at much lower prices than before. So $1000 really will go a long way, getting you something that perhaps feels like it should be a lot more. As the price of the instrument goes up, so too does the quality of woods, components, design and hardware. In other articles I’ve discussed how body woods should never be a deciding factor, as in this day and age some cheaper woods (such as basswood and alder) can be found in very expensive signature models. However, if you do hold certain tone woods in high regard you’ll be pleased to see an increase in woods such as mahogany and maple used in bodies, while you’ll also find different neck and fretboard materials such as ebony used more frequently. Depending on your style, you have a wider range of pickups on offer in this price bracket – including brand names (such as Seymour Duncan) instead of more generic manufacturer-made pickups. You’ll also find the arrival of active pickups, which can produce explosive sounds and have a huge output, which are perfect for the heavier rockers and metal players. Prefer a little jazz to death metal? Fear not! This price range also gives you a great choice of guitars offering smoother looks and sounds, including retro-inspired designs and vintage-style components, as well as hollow bodied guitars (make sure to check out our top hollow bodied guitar chart). Giant names such as Fender and Gibson have some spectacular offerings in this under $1000 category, but don’t bypass Ibanez, Dean, Kramer, Schecter and even the traditionally budget manufacturers like Epiphone, who all have some serious contenders at prices their rivals will struggle to match. Chances are, if you’re shopping around in this price range you aren’t a beginner. Who would spend $1000 on something they can’t even play – aside from an eccentric millionaire who wants to attach it to the wall in their games room? So let’s assume you are at least playing guitar to an intermediate standard, or know beyond doubt that guitar is the instrument for you. This new purchase may be your second, third or fourth guitar, which is great because now you know what you like – and what you don’t. You’re unlikely to care for an American Special Telecaster if you’re a die-hard shredder, just as you won’t be particularly fussed on Dean’s spectacular Angel of Deth model if jazz is more your thing. Think about what it is you want to achieve with this new guitar, as it will go a long way to helping you decide which model to settle on. If you are a beginner and want to have something premium to learn on, then don’t let me stop you. However it’s not necessary to spend so much on what would essentially be a learning platform. 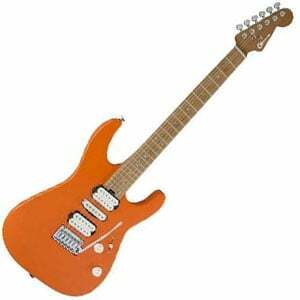 You can find some excellent guitars that will suit you perfectly in a lower price range. A great question, and one I’m sure you’ve asked yourself many times. As with any purchase, buying new gives you peace of mind when it comes to quality – especially when you’re parting with so much cash. If you spot a crack or the pickup is loose, chances are the guitar store or online retailer will repair or replace it for you – no questions asked. Buying new is also great if you change your mind, as most offer a cooling off period. Buying a used guitar in this $1000 price range is more risky, but with risk often comes reward. You could find a sensational guitar at a fraction of the price, just because it’s been played with. Or you could even find yourself a rare out-of-production model that will grow with value. If you do choose the used route, ensure you stick to a reputable online retailer like Amazon or a trusted guitar store, who can explain their returns policy to you before you purchase. Always test the guitar for as long as possible, especially through an amp (your own amp if possible). Good luck! LAY OFF THE ROCK BROTHER! I’ve played or owned all these guitars but the Kramer and the best under a grand is the jackson! Soloist or dinky #1 esp #2 schecter #3. Anyone reading this..try the jacksons and you will understand. Hello buddies…Please suggest me a guitar which covers hard rock or Metal beautifully, having great sustain of sound. I don’t play or listen too loud like heavy or death metal. Please consider my taste while you reply. I can spend 1000$ for it. Thanks in advance. Look at an Ibanez RG – several models around, so bound to find something you like especially with that budget! Fast necks, good pickups and modern rock style. Cmon man. You sound crazy. Lay off the pills. Great selection, but I prefer the ltd ec401vf or ec400vf over the ec1000. Dollar for dollar the 400s are so much more guitar for the $. Seymour duncan 59 neck jb bridge Grover tuners earvana nut. Plus you can find em used for $300. If you are in the market for a les paul style guitar the ec401vf or 400 are best bang for the buck. Prs se 245 is another great one too. The epi which I have 1 in tradition pro is a decent guitar but not worth paying $700 when the ltd 400 series is so much more for so much less. Just my 2 cents. No one in their right mind would choose the 401 or 400 over the 1000. Guys i m looking for a guitar under 700$. Currently looking at the jackson soloist slx and washburn parallaxe pxs10edlxtbm and idk what to pick really. Anyone who has experienced both or either guitar can lemme know ehat they think and i m open to other good suggestions too. I live in dubai btw and the price range according to dubai is under 2300-2400/aed (dirhams). How come the Faded is on here over the tribute T? I agree with Ollie. The Gibson LP Tribute is more beautiful than the faded and still maintain the under $1000 price tag.